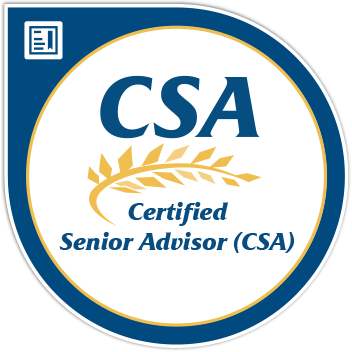 Earners of the Certified Senior Advisor (CSA)® designation have demonstrated advanced knowledge in the multiple processes of aging. CSAs understand how to build effective relationships with older adults because they have a broad-based knowledge of the health, social and financial issues that are important to older adults. Through certification, Certified Senior Advisors agree to uphold the highest ethical standards for the benefit and protection of the health and welfare of older adults. The Certified Senior Advisor certification program is accredited by the American National Standards Institute (ANSI) Personnel Program. Accreditation by ANSI demonstrates compliance to a rigorous internationally recognized accreditation process and creates a valuable market distinction for the CSA credential. The Certified Senior Advisor certification program is accredited by the National Commission for Certifying Agencies (NCCA). The NCCA Standards were developed to help ensure the health, welfare, and safety of the public. They highlight the essential elements of a high-quality program.